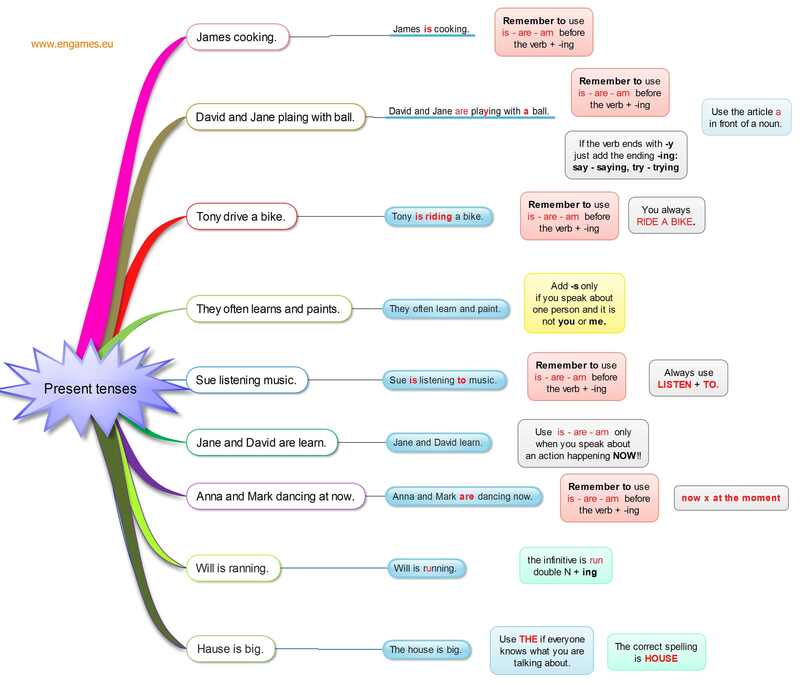 Present simple and present continuous are easy tenses to learn in English. However, as simple as they are, there are still many students who make mistakes in these English tenses. For this post I have collected the most common mistakes my students make. I believe it is much better to learn from the mistakes others make than to make them yourself and feel stupid. I have included the following activities in this post to help your students avoid mistakes in present tenses: a mind map, a worksheet, an online game on present tenses and an online quiz. I hope you and your students will find them useful. The sentence in the white fields are the mistakes, in the blue fields there are the corrected sentences and at the end, there are explanations. You should emphasize the fact that students most frequently leave out the verb TO BE in the present continuous tense. I have prepared two online quizzes this time. The first one is in Flash and it will play only on desktops. The aim of the game is to highlight the mistakes students make in English tenses. In the game students should choose the correct option and then shoot all the bad ducks. They can shoot a bottle on the side of the screen and get a bonus. The second is an online quiz in which the students should fill in the verbs in the correct form of the present tense. The passing grade is set to 75%. As this online quiz is in HTML5, they can do it on their mobile devices too. The following worksheet contains only two activities. The first one is called Hidden Picture. The students should colour the squares that contain a correct sentence. If they colour the squares correctly, a shape will emerge. The second activity is a simple fill in the gap exercise. The students should complete the sentences with the correct form of the verb. wow, so wonderful. I’d like to see and hear much more from this. It’s very meaningful and useful or these teachers such like us. Thanks so much. I will be thankful to you ! Have a look around this site. Many tenses are explained here. Amazing Mind Map. It helps in fast revision in an interesting way.